Steve Bannon's influence looms large over Michael Wolff's book, Fire and Fury, with the bombastic former White House adviser getting mentioned over three times more than any other Trump administration official. A search of the Fire and Fury ebook shows that the name "Bannon" appears 908 times. The print version of the book runs 328 pages, meaning Bannon—who was fired from the White House in August—is mentioned nearly three times a page on average. No other Trump advisers come close to having as many mentions as Bannon. The next most frequently mentioned advisers are "Kushner," referring to President Donald Trump's son-in-law, Jared Kushner, and "Priebus," referring to Trump's former chief of staff, Reince Priebus, whose names appear only 297 and 163 times, respectively. 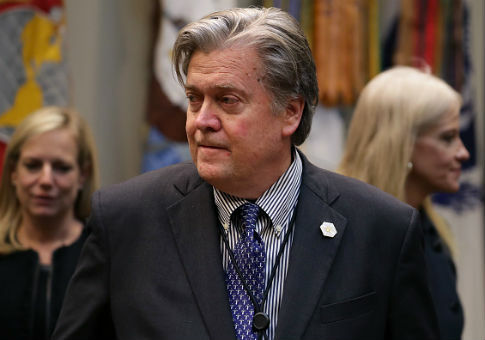 Critics have singled out Wolff's over-reliance on Bannon as a source, noting that the author did not appear to make any effort to independently verify the Breitbart chief's claims. The New York Times review said that Wolff "all but makes Bannon his co-author," resulting in anecdotes that "may include what Trump himself once called examples of ‘truthful hyperbole.'" Wolff, for his part, says it is up to his readers to decide which parts of the book are accurate. "If it makes sense to you, if it strikes a chord, if it rings true, it is true," he said Monday on MSNBC. This entry was posted in Politics and tagged Donald Trump, Michael Wolff, steve bannon. Bookmark the permalink.